Guru Nanak (1469 – 1539) was the founder of Sikhism and the first of the ten Sikh Gurus. His birth is celebrated world-wide as Guru Nanak Gurpurab on Kartik Pooranmashi, the full-moon day in the month of Katak, October–November. Guru Nanak has been called "one of the greatest religious innovators of all time". He travelled far and wide teaching people the message of one God who dwells in every one of His creations and constitutes the eternal Truth.He set up a unique spiritual, social, and political platform based on equality, fraternal love, goodness, and virtue. 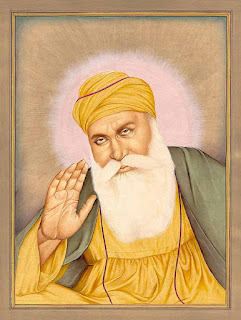 Guru Nanak's words are registered in the form of 974 poetic hymns in the holy text of Sikhism, the Guru Granth Sahib, with some of the major prayers being the Japji Sahib, the Asa di Var and the Sidh-Ghost. It is part of Sikh religious belief that the spirit of Guru Nanak's sanctity, divinity and religious authority descended upon each of the nine subsequent Gurus when the Guruship was devolved on to them.